An operable pergola is an excellent addition to the outdoor living space of virtually any home because it combines the features of both a pergola and of a patio cover in one structure. When the roof louvers are opened, the structure resembles a pergola, letting in warm sunshine from above. With a simple push of a button, those roof panels can be closed, providing full shade and better protection from the elements. Having both options available makes an operable pergola perfect for adapting to all kinds of weather. At SRA Home Products, we are proudly install these products for homeowners in Toms River, New Jersey, and surrounding areas. 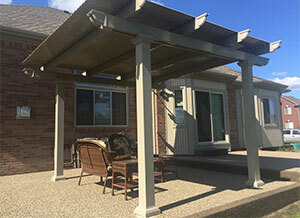 If you’d like to learn more about the operable pergola selection at SRA Home Products, contact us today. We can explain all the options that we offer and help you choose the perfect addition for your home in Toms River, NJ, or a surrounding community.